Nature-lovers appreciate how fortunate we are to have so many great parks in the Winston-Salem area. From hiking and fishing to horseback riding and playgrounds, our parks truly enhance our lives. Here is a list of some of our area favorites. For more information about reserving picnic space and other amenities, visit Forsyth Parks & Recreation. 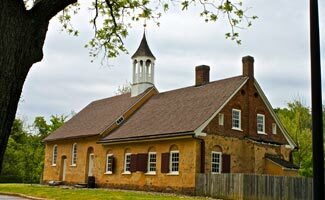 More of a historic site than your idea of a traditional “park”, Bethabara plays an important role in our city’s history as one of the early Moravian settlements, along with Old Salem and Bethania. The site is known for its historic ruins, a restored church used for great historical tours in which staff are in period dress, and over 20 acres of nature trails through wetlands. Special events are held throughout the year with old-fashioned games, wagon rides, community band performances and more. Best known for its large swimming pool (the largest in Forsyth County) with several diving boards including a high dive, Bolton Park also boasts tennis courts and paved walking trails. Another perk is that the playgrounds are all set in sand, which makes them doubly fun for little ones and safer for falls. There is also an outdoor gym with equipment under shelter. Fourth of July Park in Kernersville is Forsyth County’s first all-inclusive playground. Kids of all abilities can play on the slides, swings, towers and ramps. It is especially designed for children with sensory, mental and physical disabilities. Walking trails feature bongo and xylophone stations and a new pathway is wheelchair accessible. Other offerings at the 17-acr park include courts for basketball, tennis and pickleball, a skate park and dog park. Nestled in the Historic West End neighborhood near downtown is Grace Court Park. At the center of the park is a gazebo with surrounding benches and fountains. Grace Court is a popular wedding and event site, where events such as the West End ARTSfest, and The Big Chill ice cream social are held. In the heart of the Historic West End, Hanes Park is currently being renovated. Hanes Park sits beside the Wiliam G. White (Central) YMCA, and is getting a new front entrance, stone retaining walls, softball field and picnic tables. The new-ish playground is one of the best around. Its scenic stone bridges make it a lovely picnic spot as well. Tennis courts, running track and baseball and soccer fields are also shared with Wiley Middle School and RJ Reynolds High School next door. Located in the Gateway area just south of downtown, Happy Hill Park will soon be receiving improvements that include a new playground, a splash pad, multi-purpose play field, picnic shelter and additional parking. Hidden just off Country Club Rd, this small park has a popular playground, picnic shelter, softball field and basketball court. Though the playground is not shaded and can get hot, there is a new splash pad to help cool kids off. New playground and dog park. 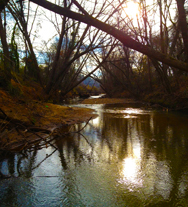 Close to Muddy Creek walking trails. A favorite among families, Joanie Moser Memorial Park encompasses playgrounds, picnic shelters, tennis and basketball courts and softball fields. Short walking trails in the woods. Large sailing ship themed playground structure. Bathrooms, picnic shelter and tennis courts. Walking trails around the park. This 1.7-mile downtown greenway runs along an abandoned railway line passes through Innovation Quarter and links MLK Jr. Drive on the north side of downtown with the Salem Creek Greenway on the south side. The Fogle Street entrance features bike racks, benches and other amenities. Now cyclists and pedestrians can traverse the 20-mile loop from Innovation Quarter to the Salem Creek Greenway without worrying about cars. North of Bethania, this park land was once the Long Creek Golf Course. Plans will be released in late summer of 2018 and include a swimming pool among other amenities. Crews recently broke ground for this new park near the intersection of Bethabara Road and Shattalon Drive. The park is named for City Council Member Nelson Malloy, who has been wheelchair-bound since his youth. The park will be specially designed to accommodate disabled children and adults and the visually impaired and include a dog park, splash pad and picnic area. Also getting a facelift, this park is a favorite for playdates for its side-by-side, but separated playgrounds, Miller Park also offers popular tennis courts, baseball and soccer fields and basketball courts. The park is set on a rolling landscape with stone bridges over babbling brooks and creeks under tall shady trees. The best kept park secret is Miller Park’s great roster of team sports for kids and adults including soccer, basketball, baseball, tee-ball and tennis lessons, as well as an after-school care program and summer camps. There is also an indoor recreational center available for use upon request. This park features a giant rocket ship tower with curvy slide. Other features include 15 picnic tables under shelter, a mister and new bathrooms. This fenced park has nice playground equipment. Swings and picnic tables set in shady area. Basketball courts, softball and soccer fields, tennis courts. Quarry Park opened to the public August 15, 2017. The park is the site of the former rock quarry owned by Vulcan Materials. The quarry was formerly Piedmont Quarry from the mid 1920s-1970s, when it closed. The quarry then filled with water. While there are currently no playground or picnic areas in the park, there is an observation pier over the quarry with great views and greenway trail connections to the Salem Lake Greenway and the Waughtown Street (via Marble Street) are being developed. Vehicles can enter the park via Reynolds Park Road and there is pedestrian access from Leight Street. 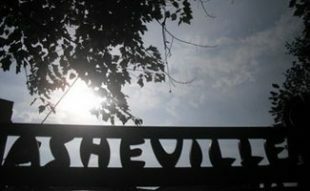 As you explore the art exhibits at the historic Reynolda House Museum of American Art and shop the unique boutiques and restaurants at Reynolda Village on the former farmland, don’t miss the hidden gem that is Reynolda Gardens. 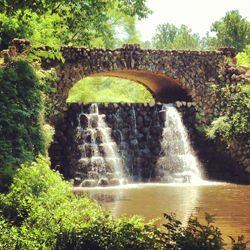 From its greenhouse and stunning formal rose gardens, there are nature trails to the boathouse and wetlands that were once Lake Katherine and beyond to the rock dam and waterfall and into the forest. The trail connects to Wake Forest University and is popular with runners. Salem Lake boasts a seven-mile greenway around its shoreline that is a favorite of runners and cyclists alike. The new marina features a tackle shop, kitchen, partially covered deck with rocking chairs, rental space for meetings and events. Fish from the new pier. Boats and kayaks are available for rent as well as Zagster bike rentals (first hour is free, then $3/hour). There is a new playground and restrooms by the lake shore/trail head. Playground, tennis courts, paved walking trail and large field for flying kites. Tanglewood has so much to offer, from activities such as golf, tennis, BMX racing, mountain bike trails and horseback riding, to a new aquatics center, dog park and RV park. Park staff offers nature workshops for kids and horseback riding lessons and trail riding. Mallard Lake is popular for picnics, fishing, and paddleboat excursions. Lodging accommodations are also available at the Manor House where you’ll also find the beautiful arboretum and rose garden. 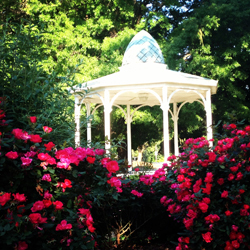 The park is also a popular wedding and event location available for rent. Special summer events include bands at the clam shell stage, a wine festival and a farmer’s market in the summer. In the fall, take a wagon ride to the pumpkin patch. And the Festival of Lights at Tanglewood draws thousands of visitors each holiday season for the spectacular lights. The oldest dog park in the city sits in this large neighborhood park. 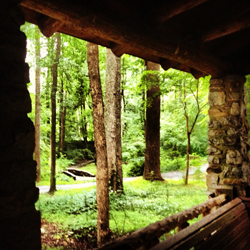 We love the winding nature trails by Silas Creek and the stone bridges all set amidst the tall trees. The paved greenway is popular with runners and cyclists and can take you right into Old Salem. This water park includes a shallow water play area with a pool and water tower, a lazy river, a 111-feet long looping waterslide and an educational maze that simulates local rivers. The Main swimming pool measures 82 x 45 feet with a depth ranging from 3.5 feet to 5.5 feet. Opens at noon and closes between 6 and 8pm. Admission is $3 for adults, $2 kids 3017 and free for kids under 3 and seniors. 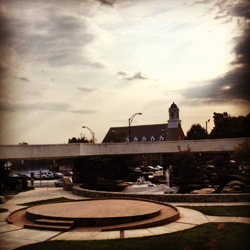 Centrally located in downtown Winston-Salem and beside the Sawtooth School, Winston Square Park is a particularly favorite event site for live music, due to its amphitheater design. Other unique features include a fountain and pool of water with large rocks and high walkway over the fountain. Find events such as the downtown summer music series, Downtown Jazz, UNCSA’s The Light Project, and weddings there. These parks are located just outside of Winston-Salem but have facilities that are worth checking out! Featuring a playground, nature trails, picnic shelter, paddle boat and row boat rentals. 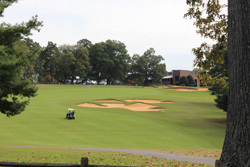 In Kernersville, straddling the Forsyth and Guilford County lines, is Triad Park. Some of Triad Park highlights include sand volleyball courts, soccer and baseball fields. 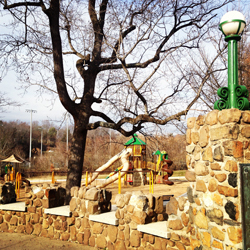 Their playgrounds are lauded the best around, including a rock climbing playground. There is also a stocked pond for catch-and-release fishing. Just 30 miles north of Winston-Salem, discover over 20 miles of hiking trails through quiet forests to streams and waterfalls, sheer cliffs, and bare rock peaks and fantastic views of the surrounding Piedmont at Hanging Rock State Park. The 7,000 acre park includes the peaks of Sauratown Mountains, an ancient mountain range named for the Saura Indians. Enjoy activities such as hiking, rock climbing (with permit), picnicking, or fishing, swimming and boating on the 12-acre lake (in season). Stay for the day or enjoy the camping areas or rental cabins for your stay. The lake and bathhouse are on the National Register of Historic Places. A quick drive up 52 N, just over the Forsyth County line in Surry County, you’ll find Pilot Mountain State Park. You can’t miss it with its iconic Pilot Knob. Stop at the overlook on 52 N for photo ops before you get there. Be sure to stop at the ranger station for more info and maps on your way up. 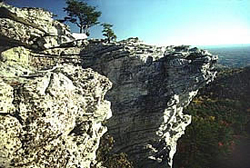 Pilot Mountain offers hiking trails at a variety of lengths and difficulty, but first you must take the short and easy walk up the Little Pinnacle Trail to get the best view of the Knob. The cityscape of Winston-Salem can be seen on clear days, as well as Hanging Rock and Sauratown Mountain. Then head over to the short, .9 mile Jomeokee Trail that circumnavigates the Knob before settling in for a picnic in the picnic area. Horseback riding is also offered and both family camping sites and the larger youth group camping sites are popular. 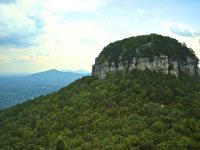 Certified mountain climbing guides are allowed to take climbers up certain areas in Pilot Mountain State Park, though climbing and rappelling is prohibited on the actual Knob. Canoeing is now offered on the lower Pilot Mountain trails along the Yadkin River. Which is your favorite local park and why? What a great summary of green spaces in Winston-Salem. Wether a local or visitor this is a helpful resource for finding places to relax, exercise, or learn about the history of our wonderful city. Thank you! Thanks for the great feedback, Desiree! We’re thrilled you find us to be a good resource! You’re most welcome!